Dieses geräumige Apartment mit Blick auf den Ozean und den Indischen Creek bietet einen möblierten Balkon, eine voll ausgestattete Küche, Zugang zu Pools im Resort-Stil, einen Gemeinschaftswhirlpool, eine Tiki-Bar an der Unterkunft und einen eigenen Strand. Versteckt in exklusiver Lage direkt am Meer, befindet sich das Alexander Resort in der Nähe erstklassiger Einkaufsmöglichkeiten, Restaurants und Unterhaltungsmöglichkeiten nur drei Meilen südlich von Downtown Miami Beach. Und Sie müssen nicht weit reisen, um Golfplätze, öffentliche Parks und lokale Yachthäfen zu finden, wo Sie ein Wasserfahrzeug mieten oder einen Angelausflug machen können. Diese Ferienwohnung ist ideal für eine Familie oder ein paar zusammen reisende Paare und bietet mehrere wünschenswerte Annehmlichkeiten wie eine gut ausgestattete Küche und einen möblierten Balkon. Gehen Sie die Treppe hinunter und genießen Sie eine Reihe von Annehmlichkeiten im Resort-Stil und einfachen Zugang zum angrenzenden, privaten Strand. Ob Sie geschäftlich oder zum Vergnügen zu Besuch sind, reservieren Sie diese komfortable Ferienwohnung direkt am Meer! * Bitte beachten Sie: Für das Parken wird eine Gebühr von 30 USD pro Nacht erhoben. * KONSTRUKTION: Bitte beachten Sie, dass im gesamten Alexander-Gebäude bis Dezember 2018 Bauarbeiten stattfinden werden. Baulärm ist wahrscheinlich während der Geschäftszeiten hörbar, und einige Balkone stehen aus Sicherheitsgründen möglicherweise nicht zur Verfügung. Bitte beachten Sie, dass sich Vacasa bei Verstößen gegen die Balkoneinschränkung das Recht vorbehält, Ihre Reservierung ohne Rückerstattung zu beenden. Aufgrund der Konstruktion ist der obere Pool geschlossen, der untere Pool ist jedoch geöffnet. Die Tiki-Bar ist von Donnerstag bis Sonntag geöffnet. * Der Alexander-Komplex verfügt über eine vom Mietvertrag getrennte Zahlungsweise. Alle Gäste müssen eine einmalige Resortgebühr von 50 USD entrichten. * Das Fitnesscenter wird bis Ende des Jahres renoviert. Kein Zugriff ist erlaubt. * Bitte beachten Sie, dass Hunde mit Ausnahme von Servicetieren nicht gestattet sind. Parken Hinweise: Parkservice kostet 30 US-Dollar pro Tag. The picture you see is the very best of the whole place. The sofa was comfortable, however, this place had so many issues it was awful. The building is very very old. It's kind of pretty downstairs when you first come into the Hotel Alexander and then, when we got to our room, it was obvious that no one had done maintenance to the condo in ages. Paint was peeling off the walls, the stove in the kitchen shot sparks and flames out when we tried to cook. The kitchen faucet and bathroom faucets were broke and constantly ran a stream of water. The cable signal was messed up and my husband and brother in law missed the second half of the super bowl and there was a stain on the carpet in my bedroom that made me sick. It was bigger than the bath towels I used to cover it up. It was a very uncomfortable stay to say the least. Thank you for sharing your thoughts with us, Melissa. We are sorry your stay was less than perfect, and we will absolutely attend to some of the easy fixes you pointed out to improve future stays. Hopefully we can host you again soon in another home- our Reservations team would be happy to help you find the perfect spot for your next getaway! This property has a very good location that’s easy to get to from the airport. 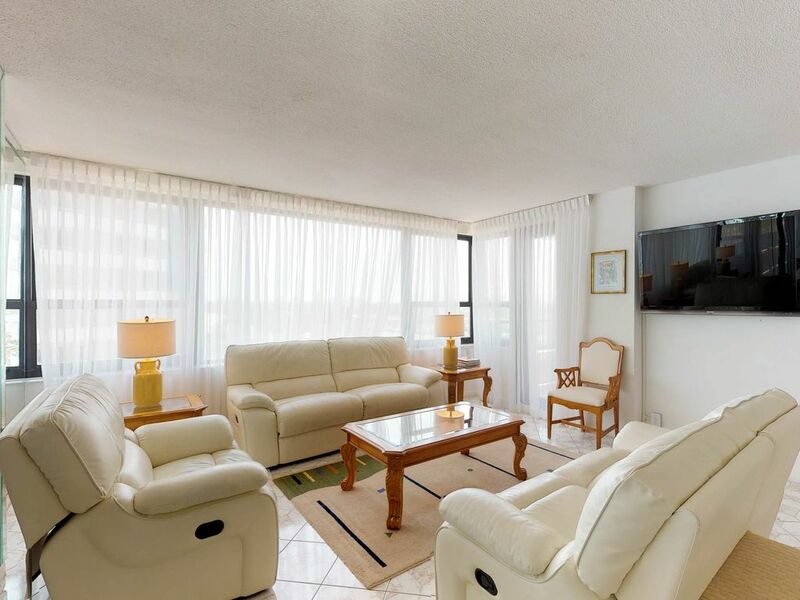 It’s very close to South Beach if you prefer to go there but not necessarily stay there. The rooms are big and comfortable. The cleaning staff maintain it well. I was especially grateful for the service. We arrived late on Saturday and I could not get the wifi to work. I also could not find a light bulb to replace the one that burned out in the bedroom. I called and got someone to help me right away with the wifi and sent someone the next day to replace the light bulb. If I had a complaint it would be that a cutting board would be very helpful to have in the kitchen. And finally the hot water knob in the big bathroom really needs to be fixed. Otherwise I would recommend this place and would stay here again. Nice location. Everything else - very unsatisfactory. Nice location. Beautiful view from the balcony. Everything else - very unsatisfactory: Dirty carpets, leaking faucets. Not even a coffee maker. To access the beach one has to go through an underground tunnel with pipes and tubes and all kind of utilities’ equipment. Pool is also small and uninviting, to say the least. The management also forgot to mention in the property description, that there is a parking charge of $30/night. Overall – very unsatisfactory. Wold not recommend. We are sorry to see you were unhappy with your visit and wish you had accepted our offer to move you to another unit that was fully clean and functioning. The issues at this condo have been addressed. Thank you! Our only wish was a can opener, and wash cloths. We had two cork screws but no can opener. So, we bought both (2 wash cloths & 1 can opener) and left them for the next guests. The place we staying in was very Nice. The condo was clean and spacious. Views were amazing! My friends and I had a great time staying here.